The Garden Eel or Taenioconger hassi is just one of the many different types of Eels that can be kept in an aquarium. Also known as Hass's Garden Eel this creature blends in by disguising itself as sea grass. You see, the Garden Eel will actually bury half of its body in the sand wait for its dinner to float by. If approached by a potential predator it will quickly burrow itself in the bottom substrate. They are also found in groups, so it literally looks like you are looking at a field of sea grass. You can check out the Garden Eel underwater in the video below. 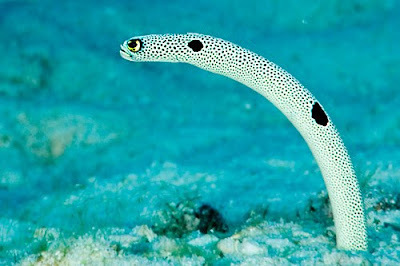 Garden Eels are quite striking with a leopard pattern of spots with two large dark spots on their bodies. They can grow to over a foot long, but most of the time you only see part of their bodies as the rest is buried in the sandy bottom. They have large eyes and a rather large mouth for their body size. If you are thinking of keeping the Garden Eel in an aquarium you should take into account the fact that they are not the easiest to care for. The do require a large tank as well, at least 100 gallons is recommended. A sandy bottom of 7" or more will keep them happy, giving them the feel of the ocean. They also enjoy a nice gentle current and a tight lid is highly recommended to keep this Garden Eel from escaping. Garden Eels should be fed a carnivorous diet consisting of feeder fish, ghost shrimp and other meaty foods. The following water conditions should help to keep this saltwater fish happy, 72-78° F, dKH 8-12, pH 8.1-8.4 and sg 1.020-1.025. If you have any additional information about the Garden Eel including caring types please let us know.